We have all heard that these charming creatures are in decline but a new report reveals that Britain has lost half its hedgehogs in less than two decades. Hedgehogs are renowned as a gardener’s friend, as they eat snails, slugs and insect pests and amongst other things habitat loss combined with the use of chemical crop controls in agriculture and by less-enlightened gardeners is devastating the population of our prickly pals. You can help hedgehogs and other wildlife by planting trees, hedgerows and woods on your land or in your local community. We can leave areas of the garden ‘wild’, with piles of leaf litter and logs. These are an attractive nest as well as a home for the invertebrates (slugs, beetles etc.) that hedgehogs like to eat. Compost heaps are also a favourite home for hedgehogs and you can even purchase purpose built hedgehog houses that will offer shelter for our prickly guests. No single garden is large enough for a hedgehog population, and no single garden can offer everything they need. It is known that one reason why hedgehogs are declining in Britain is because our fences and walls are becoming more and more secure, reducing the amount of land available to them. Hedgehogs need streets and neighbourhoods of linked-up gardens if they are to survive. Think of your garden as part of a local network by providing holes or gaps in fences and hedges that will allow them access to your garden and to your neighbour’s garden and surrounding areas. As the weather warms up hedgehogs will start to emerge from hibernation. By April, hedgehogs have spent all winter snuggled up in leafy dens in the woodlands, under hedges and in gardens and they will start to get out and about looking for food. And for hedgehogs food is a tasty, plump slug, snail, beetle, bug or earthworm. They will travel up to two miles every night in search of their supper and they will munch a staggering amount of garden beasties that are also out and about at night. This food hunting activity is perfectly timed not just with the slug and snail explosion that occurs in our gardens in spring, but also with their night-time activity. Slugs and snails in particular do most of their damage at night when the hedgehogs are at large. As the warmer weather and damp April rains encourage the slimy slugs and snails to procreate, our spiky friends are in need of food. It couldn’t be better timing. Encourage hedgehogs into your garden where they can feast on your slugs and you solve two problems at once. So the first lesson in having a hedgehog friendly garden is to live and let live, stop using garden chemicals and let nature deal with pest explosions. More slugs will attract these amazing creatures into your garden to feed on their favourite fodder. Try to avoid using slug controls altogether and instead encourage wildlife into your garden. 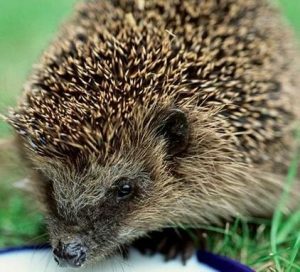 When you’ve seen the evidence of hedgehogs in the garden, you can boost their diet by putting out food, but not bread and milk as even though they will eat it they are bad for their stomachs. A constant supply of drinking water is essential, especially during times of frost and drought, while hedgehog food, dog food, minced meat or cat biscuits are ideal. Place in a shallow dish and put in a sheltered area of your garden around sunset. To avoid the food you put out being eaten by pets or foxes you could make a feeding station that is difficult for anything larger than a hedgehog to access. You could use a piece of piping, or build a shelter out of bricks and paving stones. Before cutting the lawn and using garden machinery like strimmers, disturb the area carefully by hand to warn any creatures hiding there, before you start work. Give them time to move on safely. ← The Cutting Garden… for the florists amongst you!